Zoom takes its revolutionary R16 and turbocharges it with a sampler and drum machine, 8 additional recording tracks and 6 channels of phantom-power on the all-new R24. The R24 combines four production tools into one incredibly versatile device. 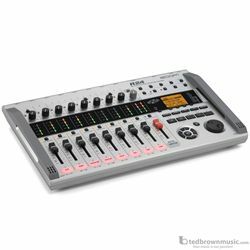 In addition to 24-track playback and 8-track simultaneous recording using SD memory cards, the R24 is a digital multi-track recorder, an audio interface, a control surface and a pad sampler. Recorder: Simultaneous recording of 8 tracks and playback of 24 tracks. The R24's simultaneous 8-track recording capability allows you to capture live band performances, record drum kits with multiple mics and make other recordings of multiple sound sources. Play back up to 24 tracks of 16/24-bit and 44.1/48-kHz sampling rate WAV format files. You can use the UNDO/REDO functions to cancel the last recording operation and restore the previous state. When you complete a song, you can mix it down and save a stereo mix for each project in the R24. Interface: Audio Interface supports 8 inputs and 2 outputs. The R24 can function as an audio interface, enabling direct input of sounds to a computer. Support for 24-bit/96-kHz encoding ensures high-quality sound. Eight input channels and two output channels can be used simultaneously. The internal DSP effects of the R24 can also be used when the sampling rate is 44.1 kHz. A dedicated knob lets you adjust the balance between the DAW playback sound and the direct input sound when monitoring. Controller: Control surface functions for most DAW software. The R24 can be used as a control surface for DAW transport functions (play, record, stop) and mixing operations. You can easily move multiple faders at the same time, which is very difficult to do with a mouse! You can also assign the five function keys to various DAW software commands. Cubase, Logic, Sonar and other major DAW applications are supported in Mackie Control emulation mode. Sampler: 24-voice sampler with 8 pads and 3 banks. The built-in sampler functions allow you to use audio files on any tracks as loops. Play the pads in real-time and create performance for an entire track by combining loops. Use the display of the audio waveform for visual confirmation when setting loop intervals. Use time-stretching to change the tempo of a file without changing its pitch, and trim unneeded parts of loops. The sampler and recorder can also be used together seamlessly, allowing you to also record instrument performances while playing back loops on other tracks. Create your own beats with the powerful rhythm machine: The R24 has a powerful drum machine with 10 types of drum kits that use linear PCM samples. With the touch sensitive drum pads, you can program your own original beats and save up to 511 of them. The rhythm patterns that you create can be used just like the audio loops. You can trigger patterns with the pads and use them in the unit's sequencer to arrange songs. The 472 preset patterns include intros, fills, endings and other phrase variations. Synchronized recording of 16 tracks: The R24 synchronization system generates a clock signal based on USB data transmission timing. (*1) Two units can be synchronized by connecting another R24 or an R16 by USB and making one unit the USB host device and the other the USB slave device. Used together, they form a recording system with up to 16 tracks of simultaneous recording and 48 tracks of simultaneous playback. (*2) (*1) : Synchronization precision is accurate to about 1 to 2 msec. (*2) : When using an R16 as the second unit, 16 tracks of simultaneous recording and 40 tracks of simultaneous playback are possible. Built in high-sensitivity stereo microphone pair: The built-in high-sensitivity stereo mic pair is handy for quickly recording phrases and melody ideas as they come to mind. Vocals and acoustic instruments can be captured with excellent clarity. Guitar amp modeling and other DSP effects total 150 types: The DSP effects, which include 150 types and 390 patches, can be used for recording, mixing and mastering. Three types of effects- the insert effect and the two send-return effects- can all be used at the same time. You can achieve a powerful amp sound just by connecting a guitar or bass directly to the R24 and using one of the 18 types of guitar amp models or 6 types of bass amp models that have been brought straight from our best-selling G2nu effects unit. You can also use the 8xCOMP EQ effect, which lets you apply compression and EQ to eight channels simultaneously. Tuner and metronome functions: The R24's built-in tuner is great for quickly tuning instruments and checking the pitches of vocals. The metronome can provide a click track for a drummer during recording and is also useful during instrument practice. The metronome sound can also be sent just to the headphones. During a live performance, this allows you to play along with a backing track previously recorded on the R24. Locate functions make editing easier: Set up to 100 markers and directly move to them whenever you want. Other convenient functions for editing include A-B repeat playback of a designated interval and auto punch-in and punch-out. Versatile inputs for guitars, mics, and line sources: The R24 can handle a variety of input sources. The unit is equipped with 8 input jacks that accept both XLR and standard phone connectors, including 6 that can supply phantom power, allowing the use of multiple condenser microphones for serious multi-mic recording. Use the channel with a Hi-Z switch to input electric guitars, basses and other high impedance instruments. Supports SDHC cards with capacities of up to 32 GB: The R24 utilizes compact and readily-available SD and SDHC memory cards as recording media. Unlike tape and disc recorders, this unit has no motor, making it more resistant to external vibrations and eliminating concerns about mechanical noise. USB 2.0 Hi-speed for fast file transfer: The R24 USB 2.0 Hi-Speed port allows WAV files recorded by the R24 to be transferred to a computer quickly and easily. Computer-based tasks, such as editing audio with DAW software, creating original CDs and importing WAV files, can be integrated into your music production. USB host port for connecting USB memory: USB flash drive or large-capacity external hard disk drive can be plugged into the R24's USB host port. This lets you distribute recordings to band members after a rehearsal and make backups of recordings without a computer. Operates with an AC adapter, batteries or USB bus power: The R24 can be powered using either the included AC adapter or six AA batteries. One set of batteries will last for about four and a half hours, providing lots of time for location recording. When using the audio interface and control surface functions, another option is to power the unit from the computer's USB bus.